There is a new TV show called America's Got Talon. It stars the talk show host Jimmy O Fallon. Robin does not like it. In fact just to spite it. He drinks just under a gallon. True. As told to me by Writer: Peter Tomasi; Artist: Lee Garbett; and Publisher: DC Comics in April 2012. Or was it Batman? 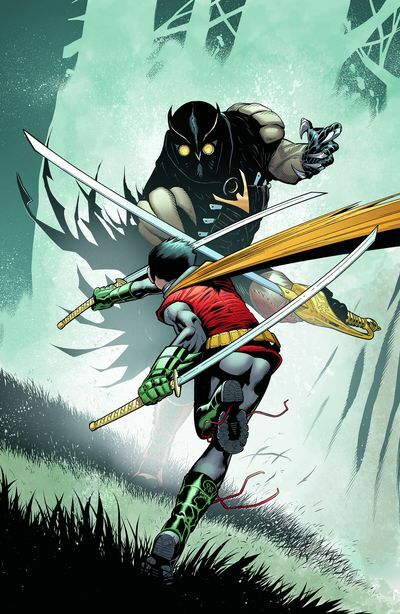 'Robin Hears A Hoo' is a Damien solo tale that impregnates the brat wonder into 'Night Of Owls' cross-over event. You see, after hearing Alfred's distress signal from Wayne Manor, this tiny titan is instructed to save Major General Benjamin Burrows from a Talon attack whilst he is out and about on manoeuvres, with the army. Thankfully Robin finds the General just in time, and tells him what is going on just before all hell breaks loose, BANG! Robin runs. Generals limp. Talons talks. Armies... errr... arm? All of which results in a resolution and a back-story that will knock your block off, CHOP! Physically and emotionally of course. 'This kid read Clausewitz and Jomini at the age of six while you were still trying to figure out what buttons to press on x-box, you imbecile. Now all of you - follow my orders! The Talon will not be in a fixed position, and neither would we'. Very Dirty Harry come Glee, isn't it? Damien's recognition that he and the Talon share similar origins was a very cleaver way of connecting them both together in essence, if not in fact. It was something I never even thought about until he stated this. By in large this was an action and adventure type tale that had a rather plodding pace to it. Also, their was a very Scooby Doo Vibe before the end, when the Talon explained to the General why he was going to kill him, just before he attempted to do so. A very groan worthy delay if ever I saw one. STORY: Alas, there was not that much in this story which I would call creative. Basically it is a 'save the victim' pretext, with a bit of back-story thrown in for good measure. Although the back-story on its own was a very nice read all in all. And had its own encapsulated flavor within the 'bigger picture'. ART: As much as I enjoyed Lee Garbett work on this issue, due to the nature of this 'event', it did feel very 'stand-in' to me. Now that is not to say that I did not like it at all. Because I did. I thought his manga-esque artwork suited a Robin solo-exploit hand's down. It's just that it came across a mite disjointed where an earthy tale was concerned. MAJOR GENERAL BENJAMIN BURROWS: Just because it would look funny if he was saved by a kid, I would like to see 'Escape from New York's' Kurt Russell play this major on the run. Can't you see him scowling at the small sod? THE SOLDIER ROBIN TALKS BACK TO: OK, for this role, you have to have an actor who you can see being told off by a kid in a mask. Hey! What about Sam's brother, Ted Raimi? He looks like the type of a chap that kids want to shout at. Run Away. A Man With A Mask Is Going To Monologue. To be completely honest with you, I am a bit disappointed with this issue really. So far the other parts of this cross-over event have been able to do something different and new with varying amount of success. Listen, don't get me wrong, it was a fairly nice read, and the pretext is a very simple one to follow. It's just that the execution that lets it down a tad. That's all.